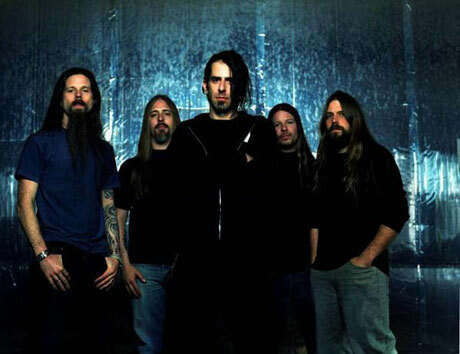 First they brought news of their upcoming fifth album and opened for Metallica, and now beloved Virginia metal act Lamb of God have announced a massive headlining tour that will span two months and a whopping 36 shows. Joining them on the road will be Children of Bodom and As I Lay Dying. The tour kicks off in Phoenix, AZ on April 2, and moves up the U.S. West coast, hitting Vancouver on April 8. From there, the bands will travel east through Canada, performing shows in Edmonton, Calgary, Saskatoon, Winnipeg, Thunder Bay, Toronto, and Montreal along the way. Then it's back to the States for another month of touring. If you're growing weary of Lamb of God's commercial aspirations, you may be perturbed by the tour's press release, which reveals that No Fear Energy Drink is the main sponsor. It also contains this doozy of a quote from No Fear VP of Marketing Britt Galland: "The music on this tour fits perfectly into the no-holds-barred lifestyle of those who buy No Fear Energy drinks and gravitate toward the action-sports properties associated with the No Fear brand image. We're anticipating another popular metal tour, along with some unique product promotions and contests." Perhaps the new Lamb of God merch will just be some antiquated No Fear T-shirts from the late '90s, who knows?